Whether they are made of natural stone, classic brick, or concrete pavers – walkways in your yard should be easy to travel. After all, it’s all about the journey more than the destination. Width. A landscape walkway should be wide enough for two people to walk side-by-side. Four feet is the minimum for a front entry walkway but 5 feet is better. Secondary walkways can be narrower depending on where they are in the yard. Shape. Small yards benefit from straight walkways. Curved sidewalks add interest but are more informal. Don’t overdo curves. That will take away from the overall look. So, consider the style of the home. Do you need to emphasize the front entry? Then perhaps a straight walkway is best. Putting a walkway through a large garden? 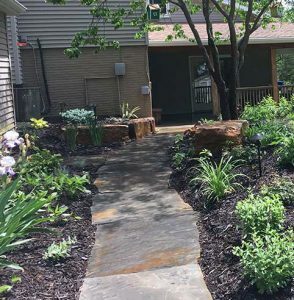 A meandering walkway in your landscape could feel just right. Materials. When deciding on walkway materials, take your cue from the home. Red brick? Pavers close in color will make it seem as if the walkway had always been there. Natural Stone? Steppers? Gravel? Keep in mind flagstone and pavers are more solid and safer to walk on than steppers or gravel. Pavers are a great choice for a walkway and clearing snow and ice is not a challenge. 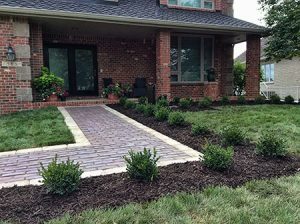 Our landscape designers at Earthly Possibilities can help you add beauty, functionality and curb appeal to your homes front or backyard landscape. Call us today to schedule a no-obligation consultation!